Legendary alternative band The Jesus and Mary Chain will be in town this weekend Friday, October the 2nd at 9 PM at the beautiful Olympia Theater in downtown Miami. I was just at the Olympia Theater this past Tuesday to see the Kraftwerk 3D show and it's a lovely theater! I remember seeing Dead Can Dance perform there back in the 90's. 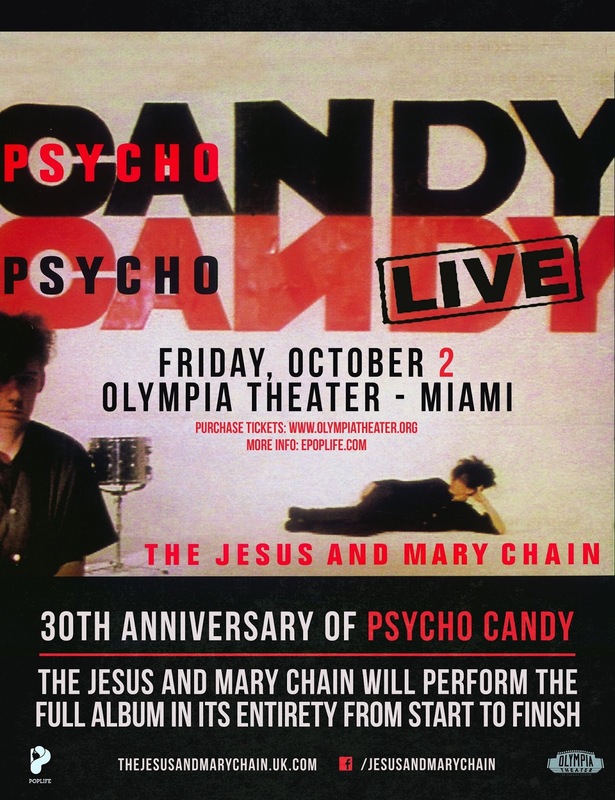 For this tour Jesus and Mary Chain are celebrating the 30th Anniversary of their amazing debut record Psycho Candy, so they will be playing that entire album, as well as an opening set of greatest hits! How amazing is that!? Can't wait to hear "Head On", and one of the prettiest songs ever made "Just Like Honey". My mind may explode!!! Check out those two videos below. If you still haven't scored tix's there are some available on Olympia's site here.